February 2013 - Abrams has sent word of a new book that makes us instantly feel old and yet makes us want to curl up with it and read it all the way through in one sitting - Did I Do That? The Best (And Worst) of the '90s. Did I Do That? The Best (And Worst) of the '90s (Abrams Image, March 2013, paperback, $19.95, ISBN 1-4197-0678-0) by Amber Humphrey is an outrageously fun compilation of 1990s pop culture that celebrates everything kids begged their parents for, and comments on what made all of it so invariably irresistible. Relive the decade that brought us the Power Rangers, Saved By the Bell, and Beanie Babies. Fully illustrated (it even includes a DIY Urkel t-shirt transfer! 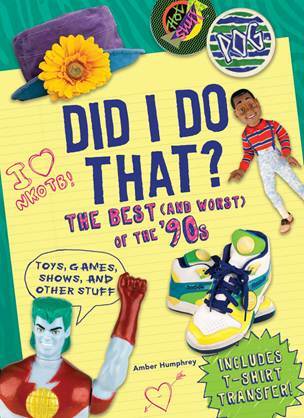 ), this jam-packed book is perfectly timed for our current craze for all things 90s.